You have already seen what I made for my #craftblogclub Secret Santa swap partner, so now it is time to reveal what I have received. When the package arrived before Christmas, it was a bit of a mystery. The address was German, but I knew it was from my Secret Santa. I thought I was the only German person taking part in #craftblogclub on Twitter, so I couldn't think of who this would be. It threw me because of my own connection to Germany, too. When I opened the handmade card that came with the package, it was even more mysterious. It began in German and then continued in English with an apology for the bad German grammar. It wasn't bad at all so I thought it was a native speaker at first. And then it finally dawned on me that I had spoken to a lady who lived in Germany, but was originally from the UK. Mystery solved! I quite enjoyed that conundrum, I have to say. Thank you, Rosie B from Craftbotic! Rosie filled the package with all manner of handcrafted Christmas decorations that went on our tree straight away, I especially liked the yarn ball baubles, holly and clay reindeer. The gifts reminded me of how I always say I will make my own decorations one day and yet I never do... Rosie has used such a variety of techniques to make her gifts to me and I love it. And this is why I love Secret Santa. It can go a bit wrong sometimes, but usually the surprises are great fun and the excitement that comes with it is the best part of it. You do your best to find something your partner will like, but you can never be sure until they receive it and say something about it. You receive a gift as well and learn something about your Secret Santa, their preferences and skills, too. 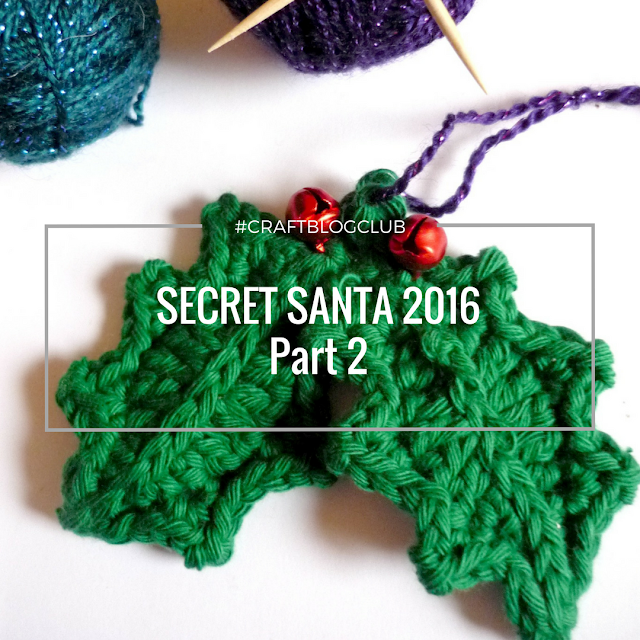 It's a lovely thing and I have enjoyed being part of 2016's #craftblogclub Secret Santa once again. What are your experiences with Secret Santa? Do you love it or loathe it? What was the best gift you ever received from your swap partner - or has it ever gone wrong? Let me know in the comments.